Site Engineering for Landscape Architects is the top choice for site engineering, planning, and construction courses as well as for practitioners in the field, with easy-to-understand coverage of the principles and techniques of basic site engineering for grading, drainage, earthwork, and road alignment. The Sixth Edition has been revised to address the latest developments in landscape architecture while retaining an accessible approach to complex concepts. The book offers an introduction to landform and the language of its design, and explores the site engineering concepts essential to practicing landscape architecture todayfrom interpreting landform and contour lines, to designing horizontal and vertical road alignments, to construction sequencing, to designing and sizing storm water management systems. Integrating design with construction and implementation processes, the authors enable readers to gain a progressive understanding of the material. This edition contains completely revised information on storm water management and green infrastructure, as well as many new and updated case studies. It also includes updated coverage of storm water management systems design, runoff calculations, and natural resource conservation. Graphics throughout the book have been revised to bring a consistent, clean approach to the illustrations. 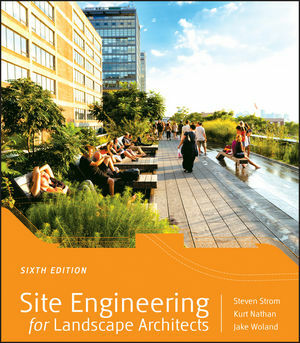 Perfect for use as a study guide for the most difficult section of the Landscape Architect Registration Exam (LARE) or as a handy professional reference, Site Engineering for Landscape Architects, Sixth Edition gives readers a strong foundation in site development that is environmentally sensitive and intellectually stimulating.